Owing to the low pressure system passing over the southern North Sea, the tide at Sheerness is forecast to be three metres over the astronomical prediction at about 9pm this evening. Fortunately this does not coincide with high water. Our friends up the East Coast and over on the Continent may not be so lucky. This entry was posted in Environment, Navigation by admiral. Bookmark the permalink. 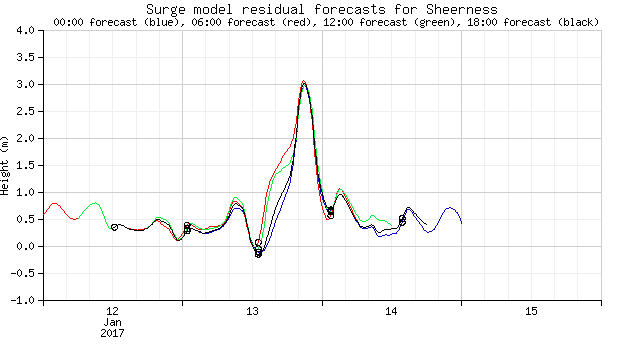 This graph looks dramatic, but it shows that this surge will peak just after LOW water, and then significantly dropping off to leave just half a meter or so above the predicted normal high tide, if the strong wind from the West continues then it may well cut off the top of the high water graph to leave levels as predicted by tide tables………..let’s hope so, this happened on Friday morning high tide.